Houston, we have a landing. On July 20, 1969, the Apollo 11 Lunar Lander touched down on the moon, heralding astronauts like Neil Armstrong and Buzz Aldrin as the first humans to successfully accomplish a lunar landing. In honor of the 50th anniversary of this moon-mentous occasion, the Houston Museum of Natural Science is bringing the moon to Houston like never before! Created by artist Luke Jerram, this sculpture features 120 dpi detailed NASA imagery of the moon’s surface, using projection mapping. Lunar features, such as Tycho, Apollo 11’s landing spot and even the elusive “dark side of the moon” are displayed in stunning resolution on this unique sculpture. 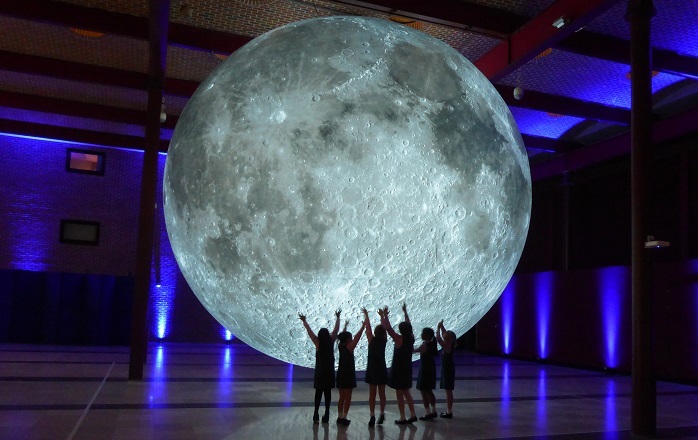 At an approximate 23 feet in diameter and an approximate scale of 1:500,000, each inch of the internally lit spherical sculpture represents 42 feet of the moon’s surface. Included with regular admission to the permanent exhibit halls and located in the Alfred C. Glassell, Jr. Hall! Blast off into space while keeping your feet on the ground. Using immersive virtual reality created by HMNS and powered by OVRx, you can land on the moon, circle the International Space Station, board Lunar Gateway and even visit a future colony on the moon’s South Pole, all from inside the museum. The action surrounds you: past, present, and future. This add-on VR experience is $5. The massive 21meter wide, high resolution image used to create the moon artwork, was created by the Astrogeology Science Centre in the USA. The imagery was taken by a NASA satellite carrying the Lunar Reconnaissance Orbiter Camera launched in 2010. 100% of the Museum Store proceeds benefit the Houston Museum of Natural Science's educational programming.